In this perceptive and revealing study, Mary Waters explores the "reinvention" of ethnicity in the lives of the grandchildren and great grandchildren of European immigrants, asking how their ethnic heritage is lived, maintained, and celebrated. Through in-depth interviews with sixty third and fourth generation white ethnics in suburban California and Pennsylvania, the author discovers a surprisingly resilient sense of ethnicity among people who could reasonably label themselves simply "American." Mary Waters' research brings to light a fascinating history of American immigration, revealing aspects of a shared culture and ideology and the unique ways in which ethnic identities fulfill very American needs. Describing the "symbolic ethnicity" of later generation white ethnics as a quintessential American phenomenon, she argues that ethnicity has retained its importance in our lives precisely because it allows people to reconcile the contradictory American values of choice, individuality, and community. 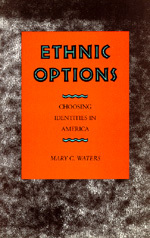 In addition to her exploration of the symbolic ethnicity of later generation middle-class whites, Mary Waters addresses its cost to society, contrasting it with the optionless ethnicity of non-white Americans. Her conclusions in Ethnic Options constitute an invaluable contribution to our understanding of contemporary American life. Mary C. Waters is Assistant Professor of Sociology at Harvard University.